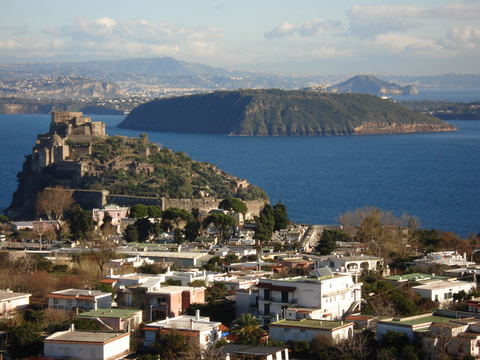 The Island of Ischia, in the Tyrrhenian Sea, is a short ferry ride from Naples.The numerous hot springs on the island, resulting from its proximity to the volcano Mt. Vesuvio, create a unique tropical climate. 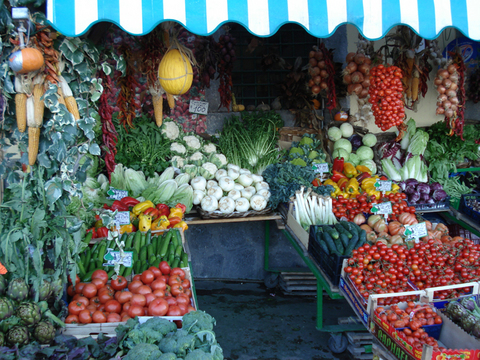 The exceptional produce available on the island is a direct result of this climate and the rich volcanic soil. The lemons, for example, were the most amazing I’ve ever experienced. They were so sweet and flavorful we ate slices of them plain, but I sure would love to try them out with some of my dessert recipes. Inevitably, Ischia is home to many spas and invites both tourists and locals to come for curative treatments from the thermal-mineral waters or just to enjoy the beautiful beaches, charming fishing villages, and spectacular panoramic views. 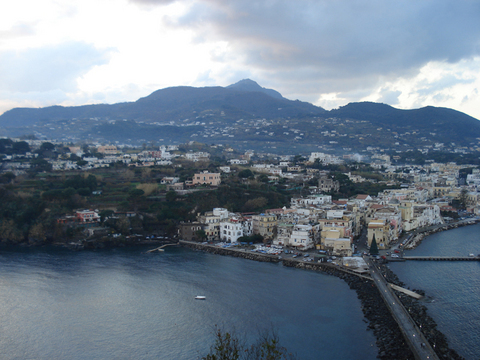 Ischia, whose highest elevation is 788 meters, is second in altitude only to the island of Elba. 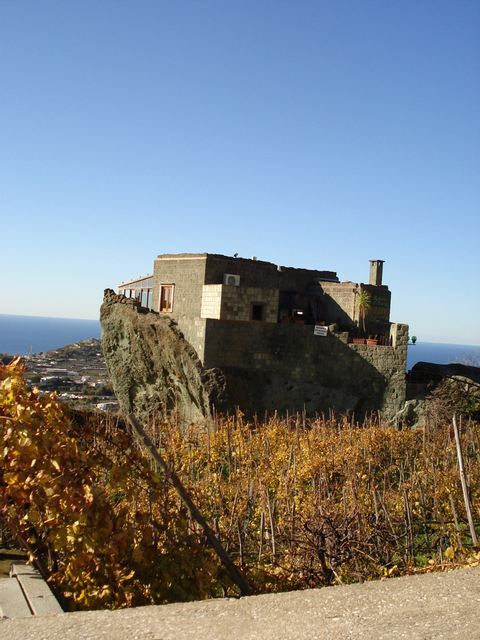 As we traveled down the winding road from the mountain top I was most intrigued by the ancient houses and wine cellars built right into the mountains. 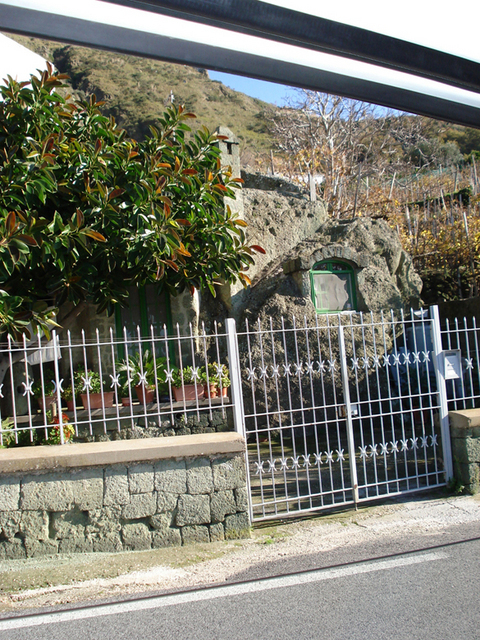 Ancient Stone Walls and Gardens Ischia is called the green island because of the preponderance of green stone. It is the only place in the world where this green stone exists other than one location in the central western part of Africa. 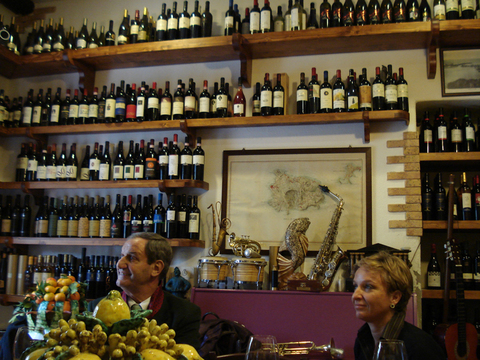 Our first lunch in Ischia was at sea level, at Un attimo DiVino. 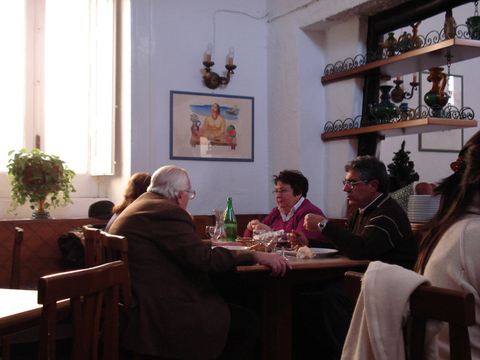 Sicilian chef-owner Raimondo Triolo was a 3 star Michelin chef in Turin who opted for a ‘simpler life.’ Lunch was served family style in this small restaurant. We were served bass three unusual and delicious ways: ‘Washed’ with the sweet lemon of Ischia (cooked by the lemon instead of heat, similar to ceviche) In ravioli with sauce made from fish bones and a little tomato and best of all as a fillet with the thinnest possible crust of overlapping potato slices Dessert was a flourless chocolate almond torte, accented by orange and glazed with chocolate. 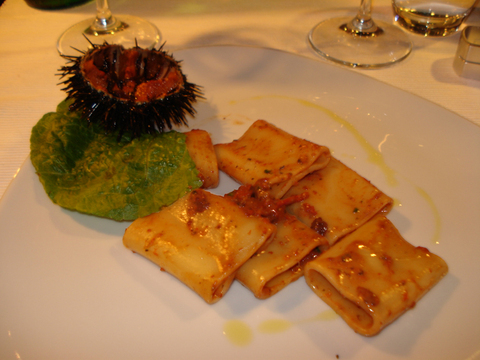 When Marlena and I passed by the restaurant the following evening at dusk, as the stars were beginning to appear in the night sky, chef Triolo was just leaving the restaurant and treated us to a saxophone solo. Despite my extremely limited conversational ability in Italian, we were able to joke about how huge and bright Venus was in comparison to Jupiter. 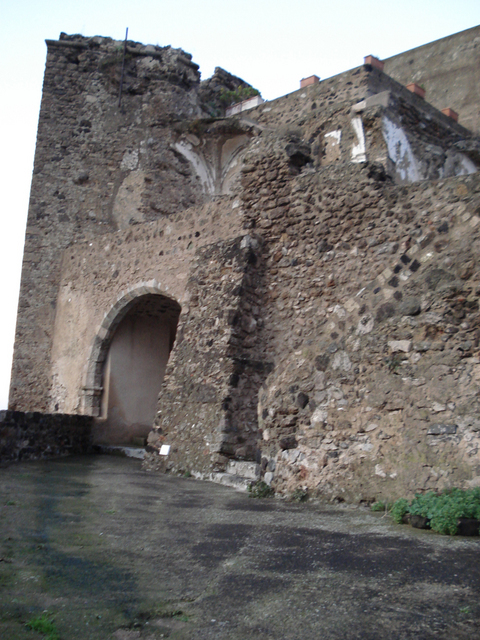 One of the most fascinating visits of our stay was to Castello Aragonese, a small fortified city on an islet connected by a bridge to the mainland (of the island! ), built in 474 BC As it was built to be a fortress, it was situated high up on a mountain and built into the rock. 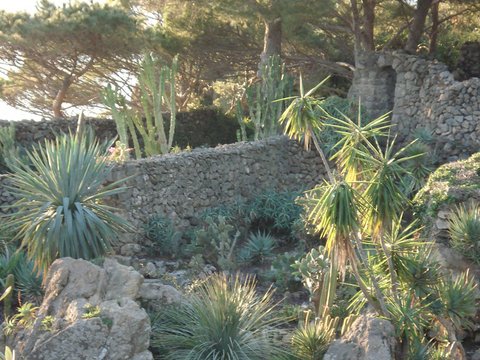 The first photo is a view from the castle. 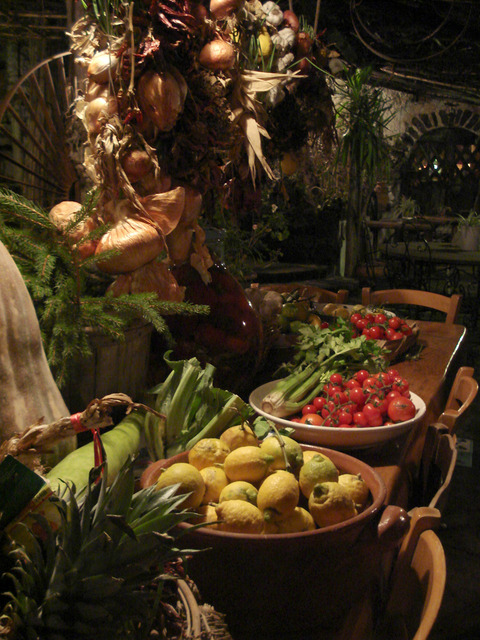 Dinner that night was at Ristorante Les Barrique, located in a rustic setting high up in the mountains. An extraordinary tasting menu was served through this kitchen window by an adorable and talented Tom Collichio-with-hair look-alike. 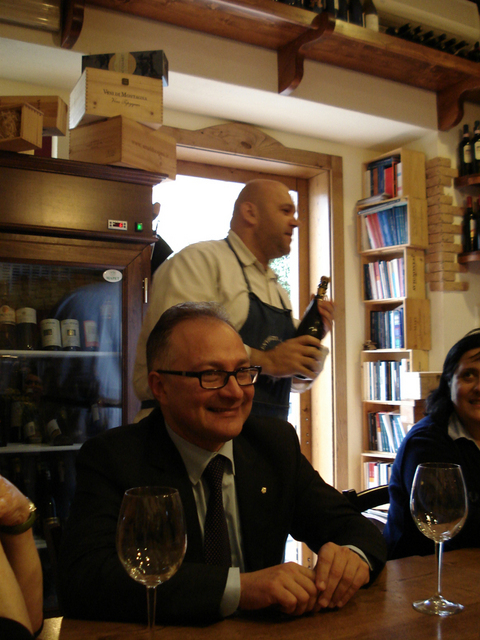 The following night we enjoyed a multi-course extravaganza at Ristorante La Vigna di Alberto. 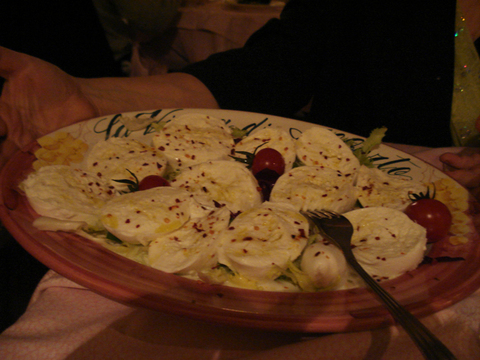 The Buffalo Mozzarella was served with pepperoncino and the fruity local olive oil. 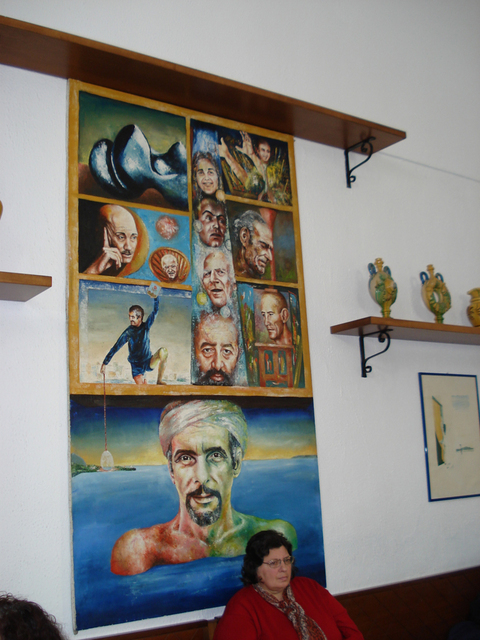 Our last lunch on Ischia was at La Tinaia Pizzeria, a casual restaurant in town that was decorated with most unusual murals. 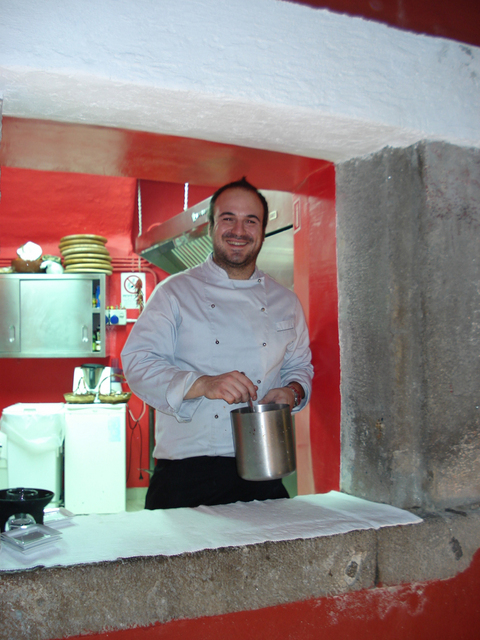 As it was Sunday, the restaurant was filled with families enjoying their Sunday dinners. 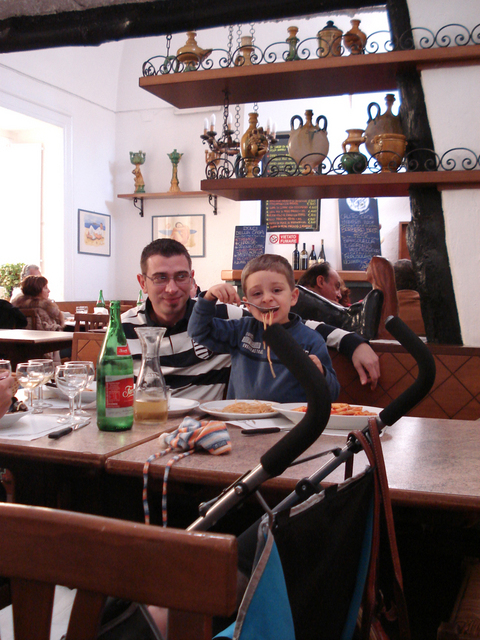 I was so charmed by this little boy learning how to eat his pasta I asked his parents for permission to photograph him. The little boy didn’t seem to mind and the papa looked on proudly if a bit shyly. 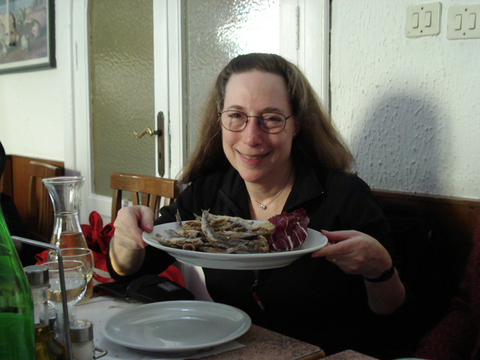 Here’s me happily anticipating a plate of fantastically fresh and flavorful deep fried sardines. 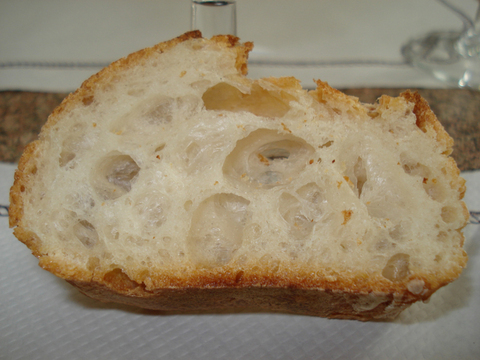 The bread was made in the restaurant’s pizza oven and was excellent both in flavor and texture. 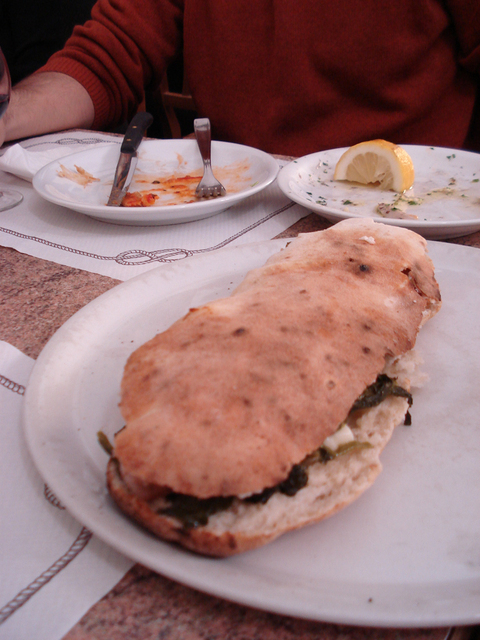 We all adored the sandwich which was called saltimbocca though not the traditional one we’ve come to expect made with veal. 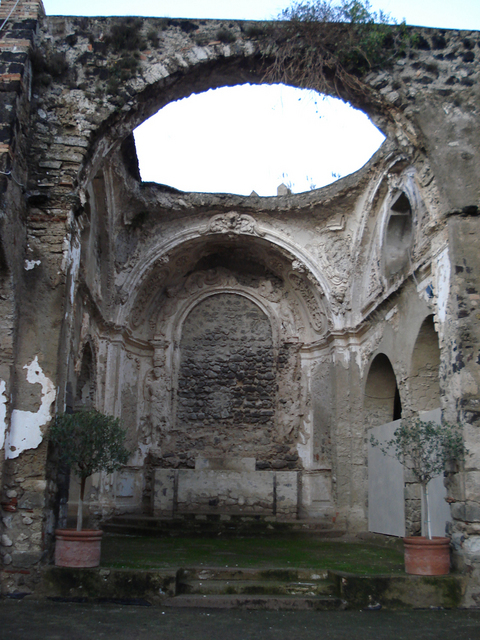 It contained slices of cooked sausage, melted smoked provolone cheese, and the beloved friarelli written about in great detail and hilarity in posting Napoli Part 1 And here’s the market where Marlena was encouraged to buy friarelli to take back on the plane to London (see Napoli Part 1!) 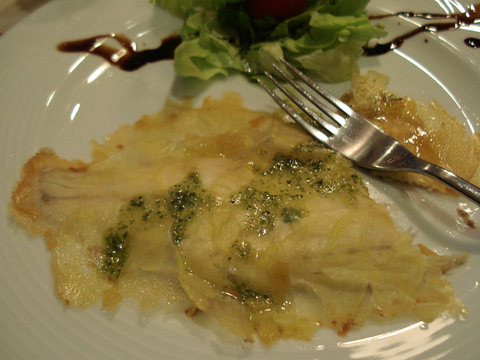 It is a perfect example of the profusion, freshness, and quality of the local produce. I have to add that writing about all this food 3 hours before dinner-time is absolutely torturing me! 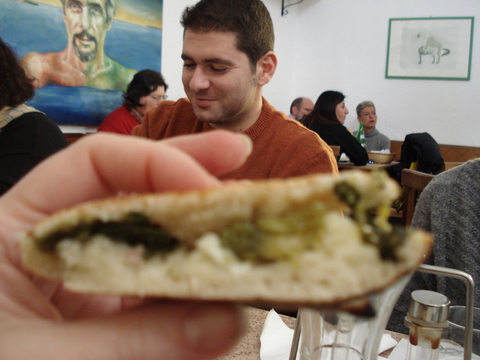 But reliving the trip is the reward and I feel as though I’ve spent about equal time writing about it as living it. I can’t wait to go back!